One night the peace of Acorn Woods is shattered as a violent storm rages. Luckily Owl and the Rainbow Scarecrows come to the rescue of their animal friends... but could they too be in danger ? The little scarecrow, Scruffy, is lying in a ditch when he’s suddenly touched by a rainbow. He’s thrilled to come to life, but soon discovers that life is full of adventures and challenges when you’re a Rainbow Scarecrow. Scruffy, the smallest of the Rainbow Scarecrows, has a wonderful surprise for his birthday. It leads to an exciting adventure and a daring river rescue! Scruffy gets a bad fright when he thinks he sees a ghost in the countryside. When the rest of the Sarecrows come across the scary figures, Owl investigates. All the animals work together to solve the problem. Simon can’t play with his new friends because his mother has so little money to spend on luxuries like a bicycle and other things. When the Rainbow Scarecrows find out, they decide to use a little magic to help. Disaster strikes the river and the Rainbow Scarecrows don’t know what to do. But Zizz is wide awake for once and surprises everyone with his clever clean-up plan! 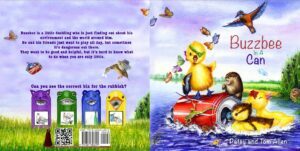 This is a gentle environmental book for younger children about their local environment and the world around them. It shows how small actions can lead to big improvements. Head for the hills is a warm and funny eyewitness account of 1960s Hollywood and some of its iconic stars.